Click HERE for our uniform guide. Don’t have time to spend picking out awards for your next pack meeting or court of honor? 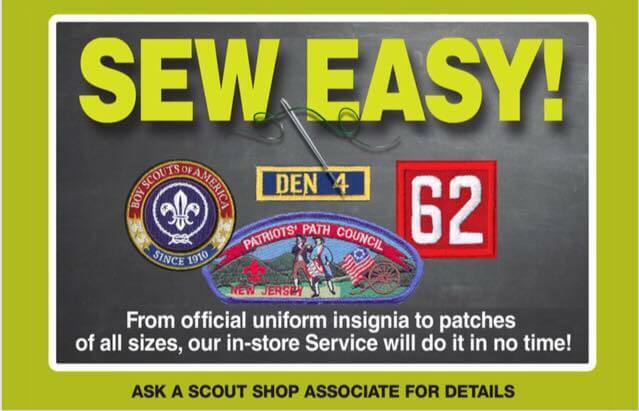 Let our Patriots’ Path Scout Shop Staff do it for you. 3. Your contact name and phone number. We will have your order packaged, rung up and ready to pick up and pay for. Please give us at least 48 hours of advance notice and we will e-mail you when your order is ready. It has been purchased less than 30 days ago. It must be in its original condition or packaging. It must have original tags attached. Original reciept must accompany return. A refund in the form of a unit account (store credit) will be established. A 15% service charge will be subtracted from the refund amount, based on the lowest price in the last 365 days. Are subject to a minimum 15% return/restocking fee. Credit for returned items will be given in the form it was purchased, unless other arrangements are agreed upon. Gift certificates will be issued in the form of a Unit Account. The Patriots’ Path Council would like to share some information about Scout Shop sales. We thought you should know that your purchases at one of our two Scout Shops, Cedar Knolls and Mountainside – helps to directly support Scouting here in New Jersey. The revenue from the Scout Shops helps us to provide and maintain three great camps. It helps us to maintain a very active Scoutreach program in the inner-city areas of our Council. It helps to support all of our web-based applications, including online camp registration. It helps provide all of the services offered at the Scout Shops, including the ability to receipt payments for all of our Council events, assistance with your purchases (especially for new families), event and camp information, and the like. When you make an online purchase from scoutstuff.org most of the proceeds from the online sale go to support the National BSA organization in Dallas, Texas. While shopping online offers some advantages we ask you to strongly consider utilizing our local Scout Shops in Cedar Knolls and Mountainside. Remember – a purchase at a Patriots’ Path Council Scout Shop directly supports youth in our area. Aug. 31 – Sept.1, Nov. 28 – Dec. 2., Dec. 24,25,31, Jan 1.